Many indigenous cuisines—from Asian and Mediterranean to Latin and African—have their roots in flavorful, nutritious plant food traditions. Inspire your clients’ the plant-based eating style with meatless dishes from around the world. You can thank programs such as Meatless Monday, which encourages consumers to go meatless just one day per week for environmental and health benefits, as well as USDA’s 2010 Dietary Guidelines and MyPlate, which emphasize loading up at least three-quarters of your plate with plant foods, for encouraging a focus on plant-based meals no matter a person’s eating style. After all, there are documented benefits from eating a plant-based diet. “Vegetarian diets always deliver more fiber, and plant foods naturally displace unhealthful fats with more healthful choices. 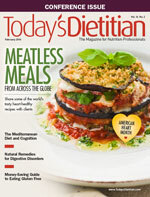 Their benefits go beyond health, too, since plant-based diets are compassionate and leave a smaller carbon footprint,” says Ginny Messina, MPH, RD, who blogs at TheVeganRD.com and is the author of Vegan for Life and Vegan for Her. One of the most intriguing facets of plant-based diets is that they can be traced back to traditional dietary patterns from around the world. Most indigenous, nonindustrialized diets, which depend on locally grown or foraged foods and few processed ingredients, are based on plants. These traditional dietary patterns evolved over centuries and were influenced by food availability, the introduction of new foods, religion, and society. Commonalities may be seen among indigenous diets, including the presence of legumes, whole grains, regional fruits and vegetables, nuts, spices, and herbs. In fact, these plant foods typically form the backbone of many traditional diets. For example, if you were enjoying a traditional meal in Japan, your meal would probably include fish, tofu, rice, vegetables in a variety of forms—pickled, steamed, or fried—and green tea. If you were dining in India, where roughly 35% of the population is vegetarian, you might feast on many flavorful vegetable dishes featuring peas, lentils, eggplant, potatoes, peas, okra, tomatoes, rice, and dozens of herbs and spices. And if you traveled to West Africa, the food vendors likely would offer you chili peppers, tomatoes, peanuts, corn, cassava, black-eyed peas, okra, onions, millet, and various leafy greens—foods at the core of their regional diet. One of the most famous plant-based eating patterns, which has been related to health benefits based on hundreds of studies, is the Mediterranean diet. The traditional eating pattern of the countries surrounding the Mediterranean Sea was characterized as a “poor man’s diet”; foods were obtained from the environment, whether it was wild greens from the hills or fruits and vegetables from home gardens. An array of plant foods forms the core of the Mediterranean diet, including wheat, beans, lentils, peas, nuts, olive oil, and a huge variety of vegetables and fruits, including greens, tomatoes, onions, eggplants, peppers, artichokes, green beans, herbs, grapes, apples, figs, persimmons, pomegranates, and citrus. “The gold-standard Mediterranean diet is a perfect example of a plant-based diet. Although meat was eaten at celebrations or on Sunday after church, the diet is centered around plants: fruits, vegetables, whole grains, healthful oils, nuts, peanuts, beans, and herbs and spices,” says Sara Baer-Sinnott, president of Oldways, an organization that promotes the health benefits of traditional diet patterns. Oldways has developed many traditional diet pyramids and programs, including the Mediterranean Foods Alliance, African Heritage & Health, and Oldways Vegetarian Network. • Borrow ideas from restaurants. One of the simplest ways to introduce global plant-based flavors into the kitchen is by being adventurous while dining out. Borrow flavor and ingredient ideas from classic restaurant dishes, such as Vietnamese pho (noodle dish), Middle Eastern falafels, Ethiopian vegetable stew with injera (teff bread), and Indian dal (simmered peas) with basmati rice. • Don’t go easy on flavor. Being shy of flavor is one thing you can’t say about most global cuisine, where cooks often have a heavy hand when they apply herbs and spices. “Great flavor with herbs and spices is something that plant-based food traditions around the globe have in common,” Baer-Sinnott says. In fact, in its most recent Mediterranean Diet Pyramid, Oldways added herbs and spices to reflect this culinary tradition. • Think fresh, seasonal, and local. Traditional diets really are the original locavore diets. Out of necessity, people ate what could be grown or foraged locally, and they preserved their bounty for use during the lean times. This can be applied to diets today, with a return to seasonal, traditional plant ingredients, such as sautéed greens following the traditions of Africa and pumpkin and squashes in stews a la South America. To help clients experience the bold flavors and nutritional benefits of meatless meals from around the world, Today’s Dietitian has provided the following samples of traditional recipes they can enjoy. — Sharon Palmer, RD, is a plant-based diet expert, the author of The Plant-Powered Diet and Plant-Powered for Life, the editor of the Environmental Nutrition newsletter, and a contributing editor at Today’s Dietitian. She enjoys developing her own global culinary traditions in her home in Los Angeles. 2. Toast the almonds in a dry skillet on medium heat, stirring frequently until they’re golden, about 3 minutes. 3. Cook the pasta according to the directions on the package. Three minutes before the pasta is ready, add the broccoli to the pasta pot. One minute before it’s ready, add the snow peas and red peppers to the pot. 4. While the pasta is cooking, make the sauce. Place the almond butter, soy sauce, lime juice, brown sugar, chili-garlic sauce, and 3 T of boiling water from the pasta pot into a large bowl, and whisk until smooth. 5. Drain the noodles and vegetables, return them to the pasta pot, add the sauce and toss to coat. Serve garnished with the toasted almonds and scallion greens. 1. Lightly oil an 8-inch square glass dish or 10-inch pie pan. Preheat oven to 350˚F. 2. Heat the olive oil in a skillet over medium heat. Add the green onions and red pepper, and cook until soft, about 5 minutes. 3. Turn off the heat and add the green chiles and corn. Set aside. 4. In a medium bowl, beat eggs and egg whites with soy or almond milk, salt, and pepper. 5. In a separate bowl, toss the cheese with the flour. Add the cheese mixture and the corn mixture to the soy or almond milk mixture and stir to combine. 6. Pour into the prepared pan and bake on the center oven rack until the surface is puffed and golden and a knife inserted in the center comes out clean, 30 to 35 minutes. 7. Let rest for 10 minutes before serving. 1. Soak kamut berries in water overnight. Drain and rinse berries. 2. Place kamut berries and 3 cups of water in a pot and bring to a boil. Cover and reduce heat to low. Simmer until soft, about 1 hour. Drain off excess water. 3. Rinse lentils and place in a pot with 3 cups of water. Cover and bring to a boil. Let boil for 2 to 3 minutes then reduce heat to low and simmer until tender, about 25 to 30 minutes. Drain off excess water. 4. Cook macaroni in plenty of boiling salted water until tender, about 6 to 7 minutes. Drain. 5. While grains are cooking, prepare onions and tomato sauce. Heat oil in a pan on medium-high heat and cook sliced onions until brown and crispy, about 10 minutes. Remove from pan and drain on paper towels. Season with salt. 6. In the same pan, add garlic, cumin, and red pepper flakes, and cook until fragrant, about 2 minutes. Add tomato purée and cook until heated through. Season with salt and pepper. 7. To serve, combine cooked kamut, lentils, and macaroni. Top with tomato sauce and crispy onions. 2. Brush the eggplant slices with the olive oil and broil 4 inches from the heat for 12 to 15 minutes, turning once, until tender and lightly browned. Set aside to cool. 3. Cut the eggplant into 1-inch pieces and place in large bowl. Add the rice, artichoke hearts, olives, and basil. 4. In a small bowl, combine the reserved liquid from the artichoke hearts with the feta cheese. Drizzle over the salad, and gently toss to coat. Season with salt and pepper to taste. 1. Cut the tempeh into cubes and place in a shallow dish. 2. Whisk together the orange juice, ginger, garlic, tamari, curry paste, and cilantro in a small bowl and pour over the tempeh. Refrigerate the tempeh and marinade for 1 hour. 3. If using a rice cooker, put the water and the rice into the cooker and prepare according to the manufacturer’s instructions. If cooking on the stovetop, bring the water to a boil in a medium saucepan. Add the rice and reduce the heat to a simmer. Cook, covered, until all the liquid is absorbed, about 20 minutes. 4. Meanwhile, heat the peanut oil in a wok or skillet. Add the carrots and sauté, stirring frequently, for 3 minutes. Add the onions and celery, and stir-fry for an additional 3 minutes. Add the pepper, snow peas, peanuts, and hemp seeds, and stir-fry for an additional 2 minutes. 5. Remove the tempeh from the marinade with a fork or slotted spoon and reserve the marinade. Add the tempeh to the vegetable mixture. 6. Add the cornstarch to the reserved marinade and whisk until smooth. Pour into the vegetable-tempeh mixture. Cook, stirring often, until the sauce has thickened and the vegetables are crisp-tender, about 2 minutes. 7. Serve the stir-fry immediately over the hot rice. Notes: If you can’t find red rice, you can substitute cooked brown rice, black rice, quinoa, or barley for the cooked red rice. Tamari is similar to soy sauce but is darker in color and slightly thicker. You may substitute soy sauce for tamari. 1. Top 5 natural food trends. New Hope Natural Media website. http://newhope360.com/breaking-news/top-5-natural-food-trends. September 6, 2013. Accessed November 18, 2013. 2. Watson E. Meat-alternatives move into the mainstream, with 36% shopping the category, says Mintel. Food Navigator USA website. http://www.foodnavigator-usa.com/Markets/Meat-alternatives-move-into-the-mainstream-with-36-shopping-the-category-says-Mintel. August 13, 2013. Accessed November 18, 2013. 3. Craig WJ, Mangels AR; American Dietetic Association. Position of the American Dietetic Association: vegetarian diets. J Am Diet Assoc. 2009;109(7):1266-1282.